As a martial artist goes through training, they will encounter many years of practicing sequences. A sequence, (Quan Tao), is a continuous flowing routine made up of a number of defensive and offensive techniques. Japanese systems often call this a Kata (or literally: "form"). As a martial artist goes through training, they will encounter many years of practicing sequences. A sequence, (Quan Tao, 拳套), is a continuous flowing routine made up of a number of defensive and offensive techniques. Japanese systems often call this a Kata (型 or 形 literally: "form"). The techniques are either a single form such as a block, punch, or kick, or they can consist of a combination of forms used for specific situations when defending or attacking an opponent. It is expected that the student will train a sequence for a period of time before being tested and advancing on to the next sequence. Usually the recommended number of times they are required to practice the sequence is 1000 times before advancing. This allows them to be able to remember it and perform it with speed and power. It is also a way for the student to preserve the history of their style and be able to pass on to future generations the knowledge of past research and investigation. In our modern society, however, students are often in a hurry to learn their sequence then rush off to learn the next one without attaining deeper knowledge of the material they have learned. This becomes obvious when attending competitions, or demonstrations where a student may demonstrate some speed and/or power in the sequence but does not show any sense of enemy. A martial artist who cannot effectively demonstrate this knowledge of martial power produces a condition known to Chinese martial artists as, “Flower fists, Brocade legs” (Hua Quan, Xiu Tui, 花 拳, 繡 腿). It means they have emphasized only the beauty of the art and not true Gong (功), or cultivation of Qi and its coordination with martial power to make the sequence alive. Additionally, some schools will train the sequences then have students spar with no regard to what they have just practiced. They have truly disregarded one of the main purposes of training sequences and in doing so; many students question the validity of practicing the sequences. Following the five regulations of Qigong theory, wu tiao (五調), one can begin to appreciate the training of sequences. When a student first learns a sequence, they are introduced to various blocks, kicks, punches, and stances. These forms are then combined to make up the sequence. Initially the student’s body will be tense as they manage to imitate what is being taught. Speed and power will be sacrificed until the student is able to master the moves through repetition. Breathing will also be unregulated as one learns the movements and the mind will be going through a conditioning period to remember which move comes next as well as how to construct each form accurately. Overtime, the body will become more familiar with the movements and be able to relax thus allowing the student to focus on increasing speed and power. Depending on the style they are training, the student will begin to feel the generation of power rooted in the foot and directed by the waist. Breathing will become more natural in accordance with the movements. Students will be able to focus more on the techniques as well as begin to learn to lead their Qi for heightened sensitivity and increased power. Eventually the student will display more confidence in their ability to perform the sequence. There still remains one element necessary and often overlooked in training the sequences. This is the ability to apply the techniques learned in the sequences. After all, the eventual goal of training is to be able to use the techniques in a free style fighting manner. These techniques were placed in the sequence because they were practical methods of defending and attacking an opponent. Additionally, this training helps the student gain a purpose behind the movements and acquire more of a sense of enemy. Students should be taught to break down the sequence and practice the techniques with a partner. This will be practiced in stages. In the first stage the student will select one of the techniques from the sequence and practice it by having the opponent attack while defending using the chosen technique. Next they will have the partner attack while using the same technique as before. This time the opponent will use another technique from the sequence as a counter. They will repeat the movements back and forth to create a fighting form, (Pan Shou or Qiao Shou, 槃手﹐橋手). Students should initially practice these actions at a slow speed so they are able to see the movements more clearly when defending and attacking. They should be encouraged to use more than one opponent when practicing the fighting maneuvers because people respond in different ways. In doing so the student will find their technique may not work certain cases. Rather than discounting the technique, they should try to understand why it does not work and learn how to adapt. Different styles contain different fighting characteristics. Some styles are designed for fighting in closer while others are designed for fighting further away. Asking for help from the master may provide a solution. The student may find that by simply adjusting their distance to the opponent the technique once again becomes useful. They may also find the technique can be applied differently or that another technique from the sequence would be better suited for that situation. Martial techniques are divided into four separate categories. The four categories are: kicking (Ti, 踢), strikes (Da, 打), wrestling (Shuai, 摔), and Chin Na (Na, 拿). Although the blocks, punches, and kicks may be visible to the novice it takes a skilled individual such as a master to recognize the deeper levels of the sequence for use in the other categories. Students should learn the sequence, practice the sequence, practice fighting forms and then the master, if knowledgeable, should show the student the deeper applications of these forms. 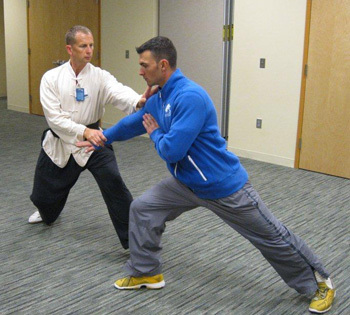 This may involve a slight modification to the stepping of the technique or a slight change to an arm movement in order for the technique to be effective. Through the lifetime of training martial arts, a student will spend many years training the sequences that have been past on for many generations. The sequences should not be discounted for their value becomes more evident as the student continues to ponder and research the meaning of the techniques they are learning. Overtime the student will realize that the repetitive nature of sequence training will prove to be beneficial and the art will continue to evolve.